Director Matt Reeves' The Batman may not have Ben Affleck front and center rocking the cape and cowl, but what it does apparently have are two main villains plucked straight from the Batman comics canon — the second of which may have just been revealed. A casting breakdown for The Batman, obtained by We Got This Covered through undisclosed sources with knowledge of the Warner Bros. production, reportedly details that the secondary baddie in the film is a character being billed as "The Brain." The nefarious ne'er-do-well by that name does actually have a place in DC Comics' rogues gallery, and has since his debut in Doom Patrol #86 in March of 1964. Most commonly positioned as an adversary to the merry band of crime-fighting misfits the Doom Patrol, the Brain is a total criminal mastermind, serving as a member of the Brotherhood of Evil and of the Secret Society of Super Villains, using his extreme intelligence and heightened durability while battling enemies and carrying out dangerous experiments on animals. His days as a genius scientist come to an end, though, when a tragic accident leaves him without a body and without any other choice but to become a brain in a case. 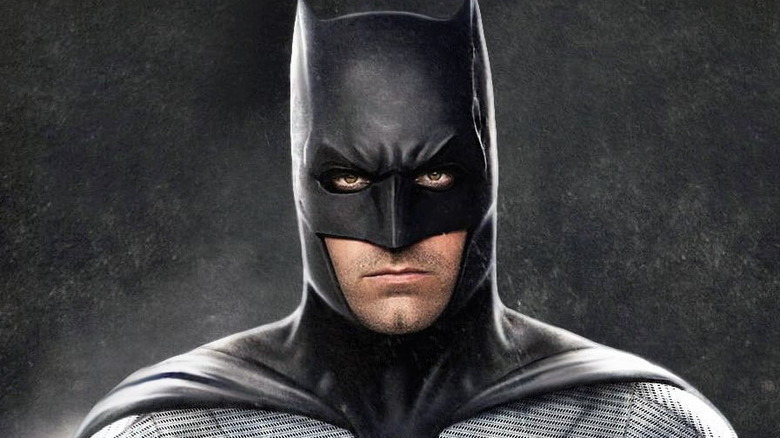 It's an interesting choice for a central antagonist in what's been hyped up as "an almost-noir driven, detective version of Batman" inspired by the works of director Alfred Hitchcock, for sure, especially considering the Brain and Batman haven't been at odds in as intense a capacity as some of the other major Caped Crusader haters. But let's pump the brakes there and take a second to speculate. Could the Brain not really be the second main villain in the forthcoming film, but simply a cipher for a different black hat set to battle Batman? We Got This Covered thinks so. According to the outlet's intel, "the Brain" as described in the casting information for The Batman isn't a reference to the disembodied brain who takes a machine gun-toting gorilla named Monsieur Mallah as his lover, but is actually "code" for an even more prominent DC Comics villain: the Riddler. If Warner Bros., DC Films, and Reeves really are using the "the Brain" as a cover-up in the breakdown, they're clever for doing so. Implementing a name that already exists in the source material will initially lead people believe the brainiac character will play a major part in The Batman, leaving only those who are familiar with the Batman comics to realize that it's all just a ruse. As avid Batman readers can infer, the "Brain" would be in reference to the Riddler's supreme intelligence. Born Edward Nigma (sometimes Nygma, as written by later Batman comics writers), the Riddler possesses genius-level smarts and revels in crafting dastardly plots that involve complex riddles, traps, and puzzles as his signature. Showy, overelaborate, and passionate about his crimes, the Riddler has long existed as one of Batman's greatest adversaries — and one of the most recognizable, enduring dudes in the superhero's collection of rogues. All this considered, it feels highly likely that the Riddler is the real secondary villain in The Batman rather than the Brain. What makes his potential presence in the Reeves-helmed flick even more plausible is that the primary bad guy of The Batman is reported to be the Penguin, another of Batman's biggest foes. A Gotham City mobster with a flair for the dramatic, a genuine love for a good tuxedo-and-monocle combo, and a penchant for looking as bird-like as possible, the Penguin (whose real name is Oswald Chesterfield Cobblepot) has frequently partnered up with the Riddler — both on-screen and off — to thwart Batman's big plans. While the Fox television series Gotham has depicted both the Riddler and the Penguin throughout the show's run, with Cory Michael Smith portraying the former and Robin Lord Taylor playing the latter, neither villain has been featured in film since the 1990s. Tim Burton's Batman Returns from 1992 featured Danny DeVito as the Penguin, while Burton and Joel Schumacher's 1995 feature Batman Forever saw Jim Carrey give a memorable performance as the Riddler. Some may view Carrey and DeVito as the only men who could do the villain's justice on the silver screen, but let's face it: it's been over 25 years since both Batman Returns and Batman Forever debuted, and the Riddler and the Penguin are due for a film face lift. New project, new actors, new plot-lines — that's what the characters need. Reeves' The Batman could be the perfect platform to offer them just that. It goes without saying that this is all guesswork for now. No one directly involved with The Batman has confirmed that the Riddler will be a part of the story. In the same vein, Warner Bros., DC Films, and Reeves haven't corroborated the talk that the Penguin will square up against Batman in the flick. Still, this information is juicy and worth finding some validity in. Rumors that surround in-the-works comic book movies usually fall into one of two categories: 1) too out-there and bizarre to actually be true, and thus instantly discredited by anyone with the slightest understanding of the film and its premise; or 2) just plausible enough to end up coming true. That we've dug this far into the idea that the Riddler will act as the second central villain in The Batman signals that this report holds some serious weight — and that the Riddler already found roots in the DC Extended Universe in Batman v Superman: Dawn of Justice through a sneaky little Easter egg adds another layer of credibility. As fans wait for someone, anyone, to step up and confirm the villains featured in The Batman, they can count down the days until the film launches on June 25, 2021. Then, after they're done tallying up the 850-plus days between now and then, they can start fan-casting the Riddler. Our money's on Leonardo DiCaprio and his wacky, wacky eyebrows.